Cricketer Yuvraj Singh married his long time girlfriend, model and actress Hazel Keech in two ceremonies, one in Chandigarh and one in Goa. Yuvraj first met Hazel at a friend’s party and was instantly bowled over by her grace and charm. It took the ace-cricketer three years of persistence to bowl the maiden over and ask her on a coffee date. After much reservation she finally agreed. Six years of courtship later, the duo decided they were a match made in heaven and decided to solemnize their union in a fairytale wedding this year. 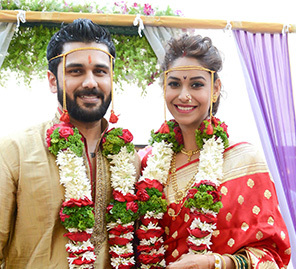 The couple traveled to Bali and Yuvraj proposed to Hazel amidst the lush greenery and the crystal clear waters of the tropical paradise. Hazel said ‘yes!’ and happily announced their engagement on her social media accounts shortly after. They kicked off their pre-wedding festivities on the 29th of November with a traditional mehndi ceremony in Chandigarh which was attended by close friends and family. Hazel wore a sunshine yellow anarkali designed by Ashley Rebello and co-ordinated it with her matha-patti by jewellery designer Astha Jagwani. Yuvraj kept it simple with a white kurta-pyjama and a schoolboy sweater in navy-blue. The couple were married in a traditional Sikh ceremony at a dera in the Fatehgarh Sahib Gurudwara in Chandigarh. In a nod to tradition their wedding attire reflected Sikh culture and was designed by JJ Valaya. Hazel and Yuvraj color coordinated – she wore a deep red lehenga with antique embroidery while Yuvraj wore an elegant sherwani with pagdi and jootis. Hazel is a Hindu of Mauritian ethnicity and the couple wanted a Hindu ceremony by the beach. They organized a second wedding at the Teso Waterfront in Siolim, Goa. The wedding was attended by many cricket and film personalities including Rohit Sharma, Rannvijay Singha, Aashish Chaudhary and Angad Bedi. Yuvraj made a grand entry into the venue on a 4×4 ATV, adorned in a kurta-pyjama and crop jacket and reflector sunglasses. Hazel wore a beautiful red embellished Benarasi saree with a zardozi kamarbandh designed by Ashley Rebello. She chose intricate Anmol Jewelers to complete her royal look. The décor was entirely in white and gold to suit the dreamy nature of the beach wedding. For their post-wedding festivities, the couple changed into pastel ensembles with Hazel wearing a beautiful, floor length fairytale gown in pale pink while Yuvraj complemented her in a muted blue suit. 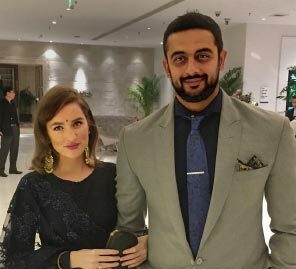 Keep watch for pictures from their splendid post-wedding reception which will be held at the ITC Maurya Delhi on the 5th and 7th of December. The theme is rumored to be a heady mix of Punjabi influences and the guest list includes the Ambanis, Bachchans, Shah Rukh Khan, Deepika Padukone, Aamir Khan, Soha and Saif Ali Khan, Salman Khan among others. 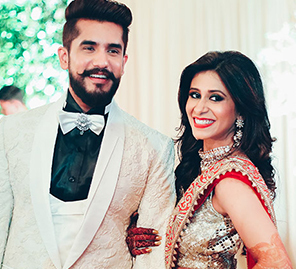 More on celebrity weddings here and visit WeddingSutra Favorites for a curated collection of wedding service providers, just for you.